Disclosure: This review based on a copy of the game provided by the publisher. The PlayStation Vita is becoming home to a wider range of RPGs these days and, settling in comfortably somewhere near the very top of that list is the latest addition to the Ys series, Memories of Celceta. It’s a fast-paced, action-filled romp with a sharp focus on genre essentials, complete with a fun cast of characters, a surprisingly involved story and a massive world just waiting to be explored. I’ve been a fan of the Ys series since the PSP days, only joining the party in time for The Oath in Felghana and the beloved Ys Seven. Those were two games that told me pretty much everything I needed to know about the series. The stories in these games are only loosely connected by a common hero, world and a few events and characters, meaning a player can easily jump in at any point without feeling like they need to play all of the previous titles. Also, rather than relying on traditional turn-based combat, the Ys games tend to focus on a more action-heavy system that see the player battling monsters and bosses in real time with enemies appearing right there on the map. Finally, these games don’t typically stretch to the epic 60 hour mark. That, to me, is a good thing. The Ys games are a lot like their combat engine: Sharp and focused. 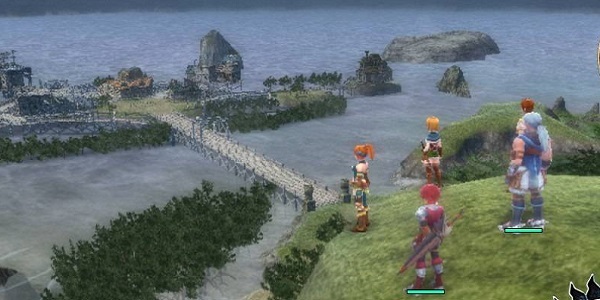 Rather than try to build some multi-layered tale of triple-crosses, love triangles and worlds on the brink of destruction, the red-headed protagonist, Adol Christin, seems to always find himself in one kingdom or another facing their own unique problems. He lends a hand, defeats a veritable army of monsters, stops an evil-doer or two and then moves on to his next adventure. Memories of Celceta holds true to these series staples, offering up a game that will take you 20-30 hours to clear, but so dense with content that you can’t help but feel utterly entertained by all of that concentrated RPG goodness. Crafting, loot, sidequests, amnesia-stricken heroes…It’s all here and it’s all a rather wonderful experience tailor-made for the PlayStation Vita. Memories of Celceta is actually a reimagining of the fourth game in the Ys series, but don’t expect moderately improved graphics and voice work tacked onto a game that came out two decades ago. Celceta has been built from the ground up for this new generation of gamers, with the original game’s main story being just about the only aspect recycled from the original. The massive world you will explore is new, the story is told in new ways and the action is on par with any other ARPG you’d find on modern consoles. I said in an earlier hands-on piece that Celceta looks like a particularly sharp PS2 game in action with character art, menues and cutscenes that look absolutely gorgeous on the Vita’s screen. Developed by Falcom and localized by XSEED, the translation is also a high mark for the game, with witty dialogue, humorous jests and even a few dramatic peaks carrying the story along at a brisk pace. This time around, Adol finds himself stumbling into a kingdom with no memory of who he is or where he came from. As his memories start to come back to him (an important game mechanic, actually) he soon discovers that his last known whereabouts were the mysterious Great Forest. After saving some local miners from a hoard of monsters, Adol is asked to head back into the forest in order to help map it out for future travelers. He and his steadily growing band of companions take on the task, discovering a deeper plot, hidden dungeons and multiple towns along the way. My one big gripe with Memories of Celceta is with how this big world comes together, which is to say in a somewhat confusing manner. I suppose that, given the fact that we’re charting an unmapped forest, it makes sense that I could become easily lost while adventuring about, but backtracking and numerous wrong turns aren’t something I typically enjoy slogging through. A fast travel system is available early on, but even that is hindered by the restriction of only being able to travel from one main area to certain other main areas. You eventually gain better access to quickly getting around, but that’s something I would have appreciated much earlier in the game. Other than that, everything from the character customization to the combat is stone solid, offering up loads of ways to tailor the game to your own play style while bashing baddies to smithereens. 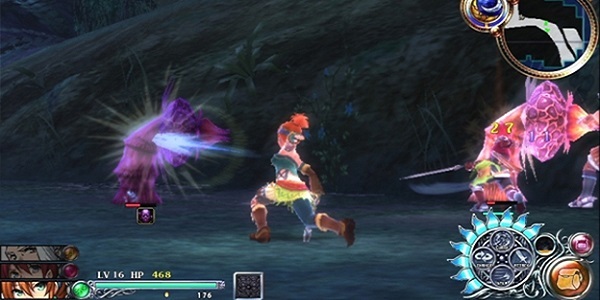 Each of the six playable characters, which you can swap between on the fly, offers up one of the three main combat types (blunt, blade, pierce). Tapping on a monster on the Vita’s screen gives you basic info about the creature, including its weakness. Choosing which combatants to fall back on in a given area is a great way to maximize the punishment you dish out. Each character also comes equipped with a basic chain attack, a block, a dodge and a collection of abilities they’ll earn upon leveling up. Dodging or blocking at the most opportune moment will give you a combat bonus or special series of attacks, and once you fill up a special gauge, each character can also unleash a sort of super move to put the big hurt on a hoard of enemies or a troublesome boss. Finally, the Vita’s unique interface is well utilized here, offering up some helpful options without coming off as gimmicks. You can quickly tap the item or map logo on the screen to gain access to the respective menu and, as I mentioned a moment ago, enemy info can be gathered with a quick tap. You can also set your teammates to a more aggressive or defensive stance by pinching or pulling your fingers across the back screen. All in all, Ys: Memories of Celceta is a great addition to the Vita library, offering one of the best reasons yet for an RPG fan to pick up one of Sony’s handhelds. If you’ve tried out the series before and didn’t fall in love, there’s little here that will change your mind. If, however, you’re a fan of the Ys series or more action-oriented RPGs in general, then this is one of the most refined, well-orchestrated offerings to date. And most importantly, it’s a lot of fun, something that too many modern titles in the genre forget to be in the midst of their stone-faced, brooding characters and overly dramatic plots.